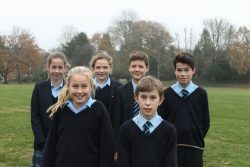 Six Cranleigh Prep pupils have been selected to play hockey for Surrey. Having already won the gold medal at the IAPS Regional Qualifier in October, the U13A girls’ team qualified for the IAPS National Finals where they reached the quarter finals. Sasha P has been chosen to represent the Panther U14 squad while Camilla B has been named in the Lions U13 squad. Eliza L, who currently plays for the U11As, has also been asked to play two years up for the Surrey U13 girls. Marcus M will be representing the Panther U13 boys’ squad and Evan G will be playing a year up with the Lions U13 boys. Sebastian S, who currently plays for the U11s, has been invited to join the GK Academy. Alison Jolly, Director of Sport, says “Many congratulations on a really fantastic achievement. I am very proud of you all”.